Its mind blowing, an event that is about to hit the city of Port Harcourt. With the success of his last event, king d comic is ready to feed your heart with laughter and joy. 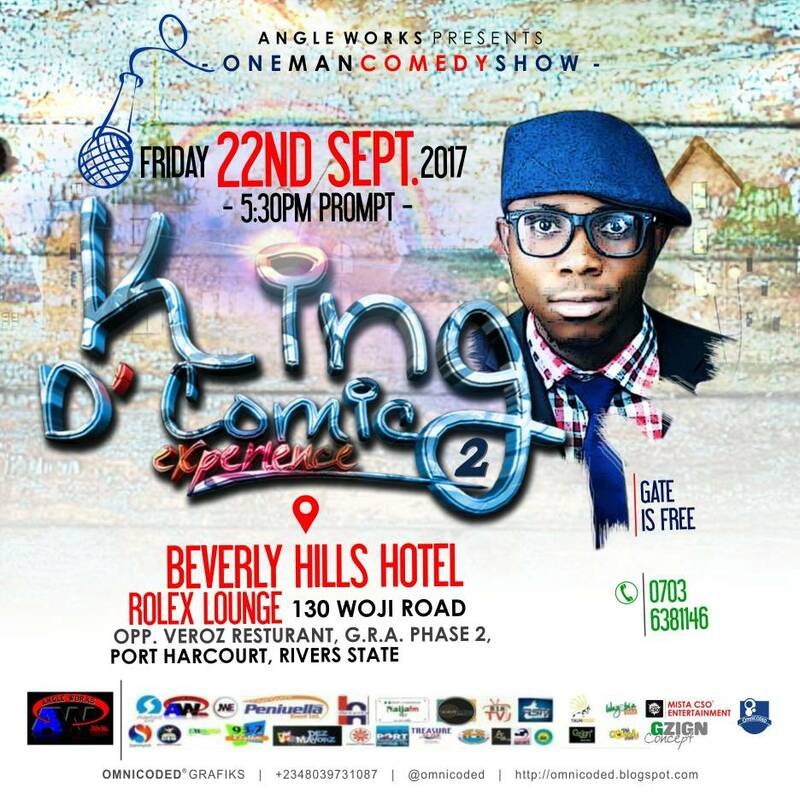 KING D' COMIC EXPERIENCE( THE ONE MAN SHOW) live in Port Harcourt. VENUE: BEVERLY HILLS HOTEL ( ROLEX LOUNGE) 130 WOJI ROAD OPP. VEROZ RESTAURANT G.R.A PHASE 2 OFF OLUOBASANJO ROAD PH. SPECIAL PERFORMANCES BY FINEST PH STANDUP COMEDIANS AND MUSICIANS. Its gonna be funnier, dramatic and comical. This event is proudly supported by TELLER AFRICA, DEZ MAYORZ, 818TVONLINE, RSTV, NAIJA FM, WAZOBIA MAX TV, RADIO RIVERS, RHYTHM 93.7FM, SILVER BIRD TV, WAVE 91.7FM, ANGLE WORKS, MR. CSO GRAPHICS, JOON WHYTE ENTERTAINMENT, GZIGN CONCEPT, PENUIELLA EVENT LTD, PORT HARCOURT SABI THE THIN, PH COMEDY CLUB, BEVERLY HILL HOTEL, SWEET TIME MEDIA, AYAYA MEDIA, AGN RIVERS STATE CHAPTER, TAUNKRIER, C.E.O MEDIA. For enquiries call 07036381146, 08074256776.